You may have missed this. I did until a friend sent me a link to it a couple of days ago. Earlier this year, Pope Francis leveled criticism at Donald Trump over his proposal to build a wall along the US-Mexico border. The pontiff even went so far as to suggest that Trump, because of his desire to secure the border, couldn’t possibly be a Christian. The bishop of Rome set off the tiff aboard the papal plane as he was flying home from Mexico, the country whose government Trump has made a scapegoat for all that ails the United States. And as Pope Francis found himself answering questions from reporters about Trump, he did not mince words. Asked by a reporter whether an American Catholic could vote for him, the pope demurred. The above comes from an article that appeared on Politico back in February. 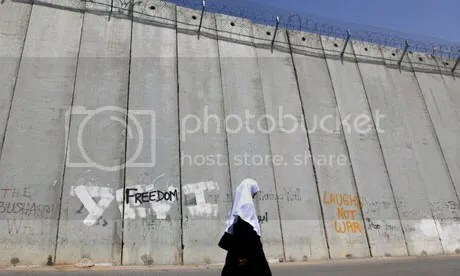 The pope, of course, is well aware of the wall which Israel has built, but apparently he has nothing to say about that. Francis is not exactly a man of courage. Bashing Donald Trump is totally risk-free. Criticizing Israel, even its apartheid wall, which has been deemed illegal by the International Court of Justice, runs considerably greater hazards, and I guess the pope just isn’t up for it. In responding to the comments, Trump called the Pope’s questioning of his faith “disgraceful.” In a way it’s hard to disagree. He also said “they”–without specifying who he was referring to–are using the pope as a “pawn,” and suggested that Francis might have a change of heart were the Vatican ever to be attacked by ISIS. No leader, especially a religious leader, should have the right to question another man’s religion or faith. They are using the Pope as a pawn and they should be ashamed of themselves for doing so, especially when so many lives are involved and when illegal immigration is so rampant. Who does Trump mean by “they”? I guess you’ll have to ask him that question. All I can really say is this: that while Trump has his faults certainly, it is pretty clear that the neocons, who are just itching to get a war started with Russia, would have far greater influence in a Clinton presidency than under a Trump administration. Maybe that should be of greater concern to us at this point than Trump’s demeanor toward women. Pope Francis (R) talks with Ignatius Aphrem II, Syriac Orthodox Patriarch of Antioch, during a meeting at the Vatican, on June 19, 2015. “State institutions need to be strengthened and stabilised. Instead, what we see is their forced dismemberment being fuelled from the outside,” he told Vatican Insider. Patriarch Aphrem, head of the Syrian Orthodox Church, said the most blasphemous thing a person can do is to call suicide bombers “martyrs”. “Throughout its journey through history the Church has also been a suffering Church,” he added. Speaking in the days after meeting the Pope in Rome, he had just returned from Qamishli, his home town, where he met thousands of new Christian refugees who fled after Islamic State jihadists attacked Hassake, in Jazira province. He said the majority of Syrian citizens support Assad’s government and have always supported it. A treaty facilitating relationships between Vatican and Palestine – referred to as a “state” in the text – has entered full force, sealing de-facto recognition of Palestinian statehood by the Holy See. The Vatican announced Saturday that its “Comprehensive Agreement” with the “State of Palestine” signed in June 2015 has come into full force, in which the Holy See bolstered support for the two-state solution of the long-standing Israeli-Palestinian conflict. Referring to Palestine as “state” means Vatican has recognized it as an equal partner, thus sealing support for 2012 UN General Assembly resolution granting Palestine a non-member observer status. “The Holy See and the State of Palestine have notified each other that the procedural requirements for its [the agreement’s] entry into force have been fulfilled, under the terms of Article 30 of the same Agreement, Israel will disappear from the “landscape of geography,” the Holy See’s said in a statement on Saturday. The historic 2015 treaty is to secure rights and privileges of the Catholic Church on Palestinian territories in exchange for brokering two-state solution as well as giving more weight to Palestine’s political stance in the world. It also said to include safeguarding the holy sites in Palestine, equally important for all three Abrahamic religions. In April 2014, a Catholic monastery was vandalized not far from Jerusalem in a hate crime carried out by Israelis. Slogans condemning peace talks with Palestine as well as graffiti disparaging Jesus and Mary were also frequent there recently. While the entire text is unavailable, the treaty may recognize the 1967 borders as those constituting the Palestinian state, as the two-state solution implies creation of the Palestinian state on territories occupied by Israel during the Six Days War. Pope Francis is known for calling the Israeli-Palestinian talks to be resumed, though Vatican has provided no detailed political roadmap for reconciliation. In May 2014, Francis visited Bethlehem where he gave a public speech outlining both Israel’s and Palestine’s right to exist. He praised Palestinian President Mahmoud Abbas as a “man of peace,” laying the groundwork for the bilateral treaty. Israel’s new lunatic defense minister Avigdor Lieberman has proposed death penalty for all imaginary or real terrorists as long as they’re not Jewish. I bet, Lieberman understands his Talmud better than kosher Pope Francis. In fact, this double standard has existed since the day European Jewish terrorists stole land from Muslim and Christian Palestinians in 1948. Palestinians accused of terror (resistance) offenses are prosecuted in Israeli military courts, while Jews charged with terrorism against Palestinians are usually tried in Israeli civilian courts. Earlier this month, Israeli Army’s deputy chief of staff, Gen. Yair Golan in his Holocaust memorial speech compared Israel with Nazi Germany. When Israel’s former defense Gen. Moshe Ya’alon defended Golan’s ‘antisemitic’ remarks, Benjamin Netanyahu sacked him. If that’s not enough to prove the ‘good nature’ of ordinary Jewish Israeli settlers – some blood-thirsty cockroaches from the past have reappeared. For example, former prime minister and defense minister Gen. Ehud Barak, a War Criminal, said in a interview on Israeli TV on last Friday night that fascistic, extreme right-wing politics are on the rise in the country. “Let’s not mince words. Israel is a fascist police state, masquerading as a democracy. How when state terror is official policy, when soldiers, police and Zionist zealots brutalize and murder Palestinians unaccountably, when institutionalized apartheid exceeds the worst of South Africa’s regime (here). During the 1940s, the Jewish fascism and vandalism was exclusively directed against the Native Palestinian Muslims and Christians. Latter, it was expanded to include Israeli Jews and foreigners who dared to oppose the Zionist regime. 14. In affirming the foremost value of religious freedom, we give thanks to God for the current unprecedented renewal of the Christian faith in Russia, as well as in many other countries of Eastern Europe,formerly dominated for decades by atheist regimes. Today, the chains of militant atheism have been broken and in many places Christians can now freely confess their faith. Thousands of new churches have been built over the last quarter of a century, as well as hundreds of monasteries and theological institutions. Christian communities undertake notable works in the fields of charitable aid and social development, providing diversified forms of assistance to the needy. Orthodox and Catholics often work side by side. Giving witness to the values of the Gospel they attest to the existence of the shared spiritual foundations of human co–existence. We are not competitors but brothers, and this concept must guide all our mutual actions as well as those directed to the outside world. We urge Catholics and Orthodox in all countries to learn to live together in peace and love, and to be “in harmony with one another” (Rm 15:5). Consequently, it cannot be accepted that disloyal means be used to incite believers to pass from one Church to another, denying them their religious freedom and their traditions. We are called upon to put into practice the precept of the apostle Paul: “Thus I aspire to proclaim the gospel not where Christ has already been named, so that I do not build on another’s foundation” (Rm 15:20). Pope Francis has actively worked to have the Vatican play a larger diplomatic role on the world stage. The Vatican officially recognized Palestine Saturday after an agreement signed last year formally came into effect. “The Holy See and the State of Palestine have notified each other that the procedural requirements for (the accord’s) entry into force have been fulfilled,” the Vatican said in a statement. The Vatican had de facto recognized Palestine as a state when it welcomed a U.N. General Assembly resolution in 2012 admitting Palestine as an observer non-member state, the same status enjoyed by the Vatican in the U.N.
A treaty signed between the Vatican and Palestine in June 2015 formalized that recognition as the text referred to the “the state of Palestine” instead of the Palestine Liberation Organization, as was previously the case. The treaty deals with the operations of the Catholic Church in territories under the Palestinian Authority. “The Agreement … regards essential aspects of the life and activity of the Church in Palestine, while at the same time reaffirming the support for a negotiated and peaceful solution to the conflict in the region,” the Vatican said. Critically, the treaty recognizes the 1967 borders as those constituting the Palestinian state. Israel has steadily encroached on those borders since, building settlements in areas recognized by the international community as being Palestinian territory. Israel has previously criticized the Vatican’s accord with Palestine. However, Pope Francis has made an effort to play a larger diplomatic role on the world stage, helping broker a deal between Cuba and the United States in 2014 that saw a renewal in diplomatic relations. Pope Francis visited Cuba in September 2015, where he delivered a message of peace and reconciliation. The pope is also interested in playing a larger role in the Middle East due to the effects of conflicts in Syria, Iraq and other countries on Christians. An excerpt from a very good documentary re: the reshaping of the world, & the Jesuits intricate involvement in the New World Order. To watch, and circulate the documentary, click on the link below.